The Earth's energy imbalance (EEI) drives global warming, because our planet traps more heat due to the continuous increase of greenhouse gases. From the energy perspective, global warming is really ocean warming, as more than 90% of the trapped heat is stored in the ocean. Therefore, the change in ocean heat content (OHC) is a primary indicator of global warming. So, the direct measurement of OHC will provide direct evidence of climate change. A key task in climate studies is the reliable estimation of historical OHC change. OHC time series provided by independent international groups reveal large differences for long-term trend, inter-annual, intra-seasonal, and decadal variability, because there are several challenges in assessing historical OHC change. Firstly, one of the major ocean subsurface observations (i.e. XBT) contains systematic bias. Secondly, temperature observations at ocean subsurface are extremely sparse, especially before 2005, since they were mainly distributed along the major shipping routes in the Northern Hemisphere. Cheng is also a lead author of a new study (Cheng et al. 2017) published in Science Advances. A new type of sensing device (the Argo float system) has been deployed during the recent decade to significantly increase the coverage of ocean data. However, still over 60% of the ocean grids are without any observations (if the global ocean is separated into 1 degree and 1 month grids). Therefore, a gas-filling process is required to make a "guess" for the change in temperature in the ocean grids without observations. In other words, the ocean changes that occur at two different locations are not completely independent, but they are correlated under physical rules. This gap-filling process utilizes the correlation to reconstruct the missed information. In global OHC calculation, the choice of different gap-filling processes is the major error source. The new study, led by IAP, CAS, collaborated with NOAA, University of St. Thomas, and NCAR, made a significant step to assess historical OHC change. This study used an advanced XBT bias correction technique, which is reccommended according to an XBT community paper published in Bulletin of the American Meteorological Society in 2016. This ensures that the observation bias is reduced. The key step made by this new study is the use of an advanced gap-filling process and a careful assessment on the results. It is pointed out that this study uses the information of current well-observed ocean states, but takes a subsample from it using the sparse distribution of observations in the distant past in order to reveal that the process generates amazing results since the late 1950s. This new study enables a more accurate assessment of heat accumulated in the ocean (and Earth) system. 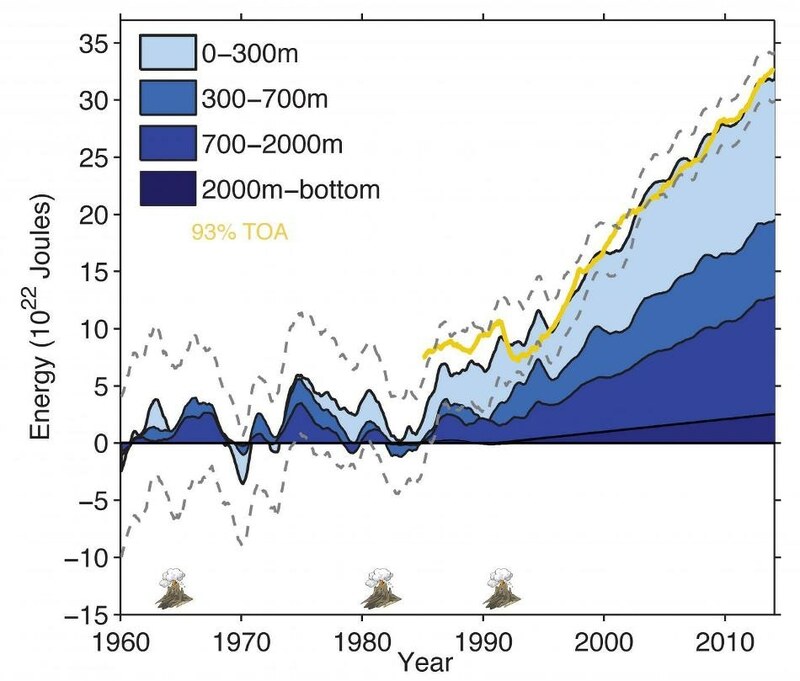 The accumulation of inferred ocean energy is larger than earlier estimates, such as from the previous Intergovernmental Panel on Climate Change Fifth Report (IPCC-AR5) in 2013. However, it is consistent with the direct EEI observations at top of atmosphere since the late 1980s. This new observation at OHC and EEI changes over time and offers greater confidence. The data sets produced from this observation are a valuable resource for carrying out more study on climate change. This study provided a new reconstruction on ocean subsurface temperature change since 1960 for 0-2000m depths, and assessed historical ocean energy budget more accurately. So it will be a valuable resource for future studies of oceanic variability and its climatic impacts on both regional and global scales.